Few Americans have known greater acclaim or more bitter criticism than Herbert Hoover. The son of a Quaker blacksmith, Hoover was orphaned at the age of nine and sent to live with relatives in Oregon. Few expected the boy to amount to much, yet he defied those expectations and achieved international success as a mining engineer and worldwide gratitude as the “Great Humanitarian” who fed war-torn Europe during and after World War I. In the process, he developed a unique philosophy—one balancing responsibility for the welfare of others with an unshakable faith in free enterprise and dynamic individualism. In time this would lead him to feed more than a billion people in fifty-seven countries. He was elected thirty-first President of the United States in a 1928 landslide, but within a few short months he had become a scapegoat in his own land. Even today, Herbert Hoover remains indelibly linked to an economic crisis that put millions of Americans out of work in the 1930s. His 1932 defeat left Hoover’s once-bright reputation in shambles. But Herbert Hoover refused to fade away. In one of history’s most remarkable comebacks, he returned to public service at the end of World War II to help avert global famine and to reorganize the executive branch of government. Usually cast as a President defined by his failure to contain the Great Depression, Hoover’s story is far more complex and more interesting. To begin with, Hoover was an activist reformer, albeit one without the political skills needed to sell himself and his programs to Congress and the public. A shy man, he insisted on keeping much of his life and good deeds out of the public eye. Only in politics is this a character flaw, yet it prevented those around Hoover from portraying him as a compassionate leader, or warding off portrayals of him as a cold, uncaring figure responsible for nearly everything that was going wrong in the American economy. As a result, Hoover’s presidency remains largely an untold story. It began when Calvin Coolidge chose not to run for a second term in 1928. Hoover, then secretary of commerce (and joked Washington wags, “assistant secretary of everything else”), made no secret of his interest in succeeding Coolidge. Few men seemed so prepared for the nation’s highest office. After all, he had fed Belgium, run the U.S. Food Administration for Woodrow Wilson, revolutionized the Department of Commerce, and ministered to victims of the Mississippi River flood. More realistic than Wilson, more respectable than Warren Harding, more imaginative than Calvin Coolidge, Hoover appeared an ideal candidate. Few Americans asked whether the Great Engineer had a political temperament. It was an uphill campaign for Hoover’s Democratic opponent. Governor Alfred E. Smith was a colorful, charismatic product of New York’s lower East Side and an urban hero to many. But as the first Catholic to be nominated for President, Smith was targeted by nativist elements. 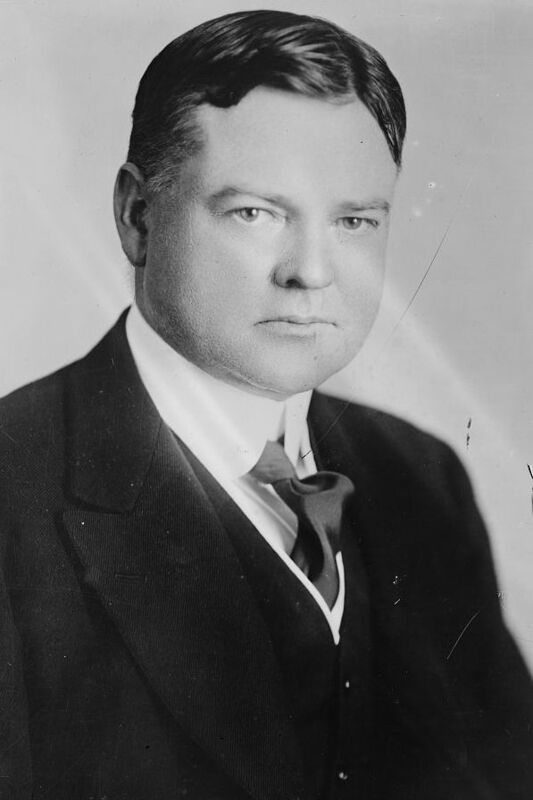 One of the few major issues dividing the candidates was Prohibition, with Hoover supporting the constitutional ban on manufacturing and selling alcoholic beverages and Smith pressing for its repeal. In November voters overwhelmingly endorsed the Republican ticket, giving Hoover 58 percent of the popular vote and 444 electoral votes to Smith’s 87. True to his instincts, Hoover’s first months in office were a whirlwind of reform. Within thirty days of his inauguration, the new President announced an expansion of civil service protection throughout the federal establishment, canceled private oil leases on government lands, and directed federal law enforcement officials to focus their energies on gangster-ridden Chicago, leading to the arrest and conviction of Al Capone on tax evasion charges. A Hoover-appointed commission paved the way for an additional 3 million acres of national parks and 2.3 million acres in national forests. In the summer of 1929 the President convinced a special session of Congress to establish a Federal Farm Board to support farm prices. He pressed ahead with plans for a series of dams in the Tennessee Valley and in central California and tax cuts graduated to favor low-income Americans. In other domestic initiatives, Hoover created the Veterans Administration and doubled the number of veterans’ hospital facilities, established the antitrust division of the Justice Department to prosecute unfair competition and restraint of trade cases, required air mail carriers to improve service, and advocated federal loans for urban slum clearance. Hoover was similarly activist in his foreign policies. Determined to halt the arms race, he imposed an arms embargo to Latin America, proposed a one-third cut in the world’s armadas of submarines and battleships, and sought unsuccessfully to eliminate all bombers, tanks, and chemical warfare. The administration negotiated a treaty authorizing construction of the St. Lawrence Seaway along the U.S.-Canadian border, only to have it fall victim to senatorial opposition. Hoover was not shy about sharing his concerns about the American economy. As early as 1925, then-Secretary of Commerce Hoover had warned President Coolidge that stock market speculation was getting out of hand. Yet in his final State of the Union Address, Coolidge saw no reason for alarm. Hoover, however, remained fearful. Even before his inauguration, he urged the Federal Reserve to halt “crazy and dangerous” gambling on Wall Street by increasing the discount rate the Federal Reserve charged banks for speculative loans. He asked magazines and newspapers to run stories warning of the dangers of rampant speculation. Refusing to accept the “natural” economic cycle in which a market crash was followed by cuts in business investment, production, and wages, Hoover summoned industrialists to the White House on November 21, part of a round-robin of conferences with business, labor, and farm leaders, and secured a promise to hold the line on wages. Henry Ford even agreed to increase workers’ daily pay from six to seven dollars. From the nation’s utilities, Hoover won commitments of $1.8 billion in new construction and repairs for 1930. Railroad executives made a similar pledge. Organized labor agreed to withdraw its latest wage demands. Economists are still divided about what caused the Great Depression and what turned a relatively mild downturn into a decade-long nightmare. Hoover himself emphasized the dislocations brought on by World War I, the rickety structure of American banking, excessive stock speculation, and Congress’s refusal to act on many of his proposals. The President’s critics argued that in approving the Smoot-Hawley tariff in the spring of 1930, he unintentionally raised barriers around U.S. products, worsened the plight of debtor nations, and set off a round of retaliatory measures that crippled global trade. Neither claim went far enough. In truth, Hoover’s celebration of technology failed to anticipate the end of a postwar building boom, or a glut of twenty-six million new cars and other consumer goods flooding the market. Agriculture, mired in depression for much of the 1920s, was deprived of cash it needed to take part in the consumer revolution. At the same time, the average worker’s wages of $1,500 a year failed to keep pace with the spectacular gains in productivity achieved since 1920. By 1929 production was outstripping demand. The United States had too many banks, and too many of them played the stock market with depositors’ funds or speculated in their own stocks. Government had yet to devise insurance for the jobless or income maintenance for the destitute. With unemployment, buying power vanished overnight. Together, government and business actually spent more in the first half of 1930 than in all of 1929. Yet such bold action did little to help the economy as frightened consumers cut back their expenditures by 10 percent and a severe drought ravaged the agricultural heartland beginning in the summer of 1930. Foreign banks went under, draining U.S. wealth and destroying world trade. Unemployment soared from five million in 1930 to more than eleven million in 1931. A sharp recession had become the Great Depression. No American President entered office with greater expectations, or left with more bitter disappointments, than Herbert Hoover. “I only wish I could say what is in my heart,” he remarked as hard times engulfed the nation and his popularity evaporated. Herbert Hoover’s heart never could subdue his head. In between nibbles at Camp Rapidan, the fishing camp in Virginia’s Blue Ridge Mountains he built with $120,000 of his own money, the embattled President held front-porch conferences with congressmen and economic advisers. “I have discovered that even the work of the government can be improved by leisurely discussions out under the trees,” said Hoover. All that work took its toll. After the White House physician urged Hoover to lose weight, he adapted a game of medicine ball he had first played during a Latin American journey. For thirty minutes each day, seven days a week, Hoover and his “Medicine Ball Cabinet” heaved a six-pound medicine ball back and forth over a volleyball net. It was a game that burned up three times as many calories as tennis and six times that of golf. But this sports-loving President couldn’t relax in public. For example, he stopped one afternoon to watch a sandlot ball game, cheering on the kids at play and informally chatting with them after the game ended. Colleagues urged the President to return the next day and be photographed with the boys, saying it would be good for his public image. Hoover would do nothing of the kind! It was one thing to relax, however infrequently, quite another to perform. “You can’t make a Teddy Roosevelt out of me!” he proclaimed, to the despair of advisers. Generous to a fault, Hoover was one of two American Presidents to give away his salary (John F. Kennedy was the other). He anonymously donated $25,000 a year to aid victims of the Depression and raised $500,000 toward the 1930 White House Conference on Child Health and Welfare. True to form, the President kept his own family shielded from view. Young Allan Hoover, a student at Stanford University, appeared infrequently at the White House. And when Herbert Junior was confined to a North Carolina treatment center for tuberculosis, his father could only spare time for a single visit. During this period the President’s daughter-in-law, Margaret, and her children, Peggy Ann and Herbert III (known as Pete) lived at the White House. The 1930s equivalent of spin doctors wanted the youngsters brought into the spotlight, if only to soften their grandfather’s somewhat down image, but Hoover flatly refused to exploit his family. Richard Norton Smith is the former director of the Herbert Hoover Presidential Library-Museum. He also served as director of the Eisenhower, Reagan, and Ford presidential libraries and most recently he was executive director of the Robert J. Dole Institute of Politics. He is currently the executive director of the Abraham Lincoln Presidential Library-Museum. A prolific writer, Smith is the author ofAn Uncommon Man: The Triumph of Herbert Hoover (1984) and is at work on a biography of Nelson Rockefeller. Timothy Walch is the current director of the Hoover Presidential Library-Museum. Prior to coming to West Branch, he served as editor of Prologue. Walch is the author or editor of many books including (with Richard Norton Smith) Farewell to the Chief: The Role of Former Presidents in American Public Life (1990) and At the President’s Side: The Vice Presidency in the Twentieth Century (1997). Most recently he published Uncommon Americans: The Lives and Legacies of Herbert and Lou Henry Hoover (2003).